There is now another choice…In October Apple announced a new thinner Apple 27-inch iMac . There are issues with deliveries at present and the product is not expected until December at the very earliest. At the same time Apple announced a new Mac mini with new faster processors and the Mac mini is available for fast delivery…. and it’s cheaper and very upgradeable. It represents a valid and flexible alternative… MacWorld magazine described it this week as “one of the fastest Macs ever tested.” We have highlighted the following bundle as an alternative and would ask you to consider this option. The Mac mini option is faster than the iMac ; with an i7 CPU … and cheaper with a bigger and somewhat stylish Samsung screen. 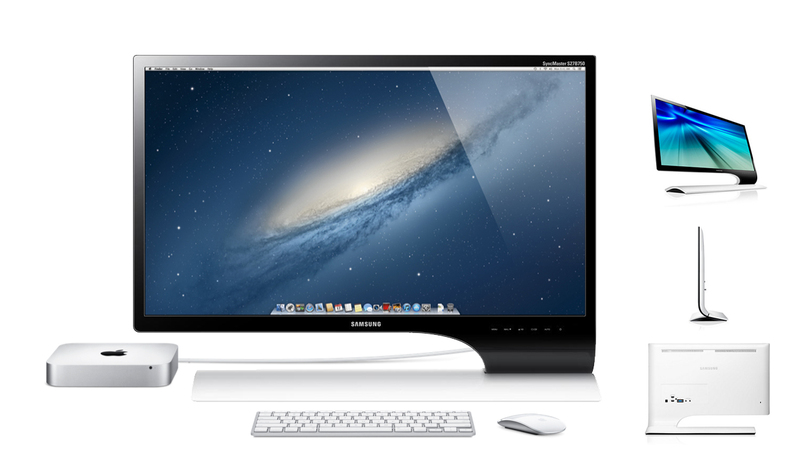 The mini is configurable up to 16GB Ram with options on SSD and Fusion drives up to 2TB and is available with the Apple 27” Thunderbolt Display as well should you not like the stylish Samsung display we have selected to go with the Mac mini. Please contact us for a bespoke quotation if this configuration isnt right. The Mac mini i7 bundle is available to ship now; we have available to lease within days the Fusion Drive versions which are three times faster than a traditional hard drive. The new iMac is a great looking unit but this new bundle from HardSoft represents a similarly stylish bundle that is also cheaper AND AVAILABLE TO SHIP WITHIN 24 HOURS. These Mac mini bundles are also available on the 21″ iMac and are available for Home Users on a 0% interest free credit.